This blog entry was first posted on June 17 2012, and revised and re-published on April 6 2012. 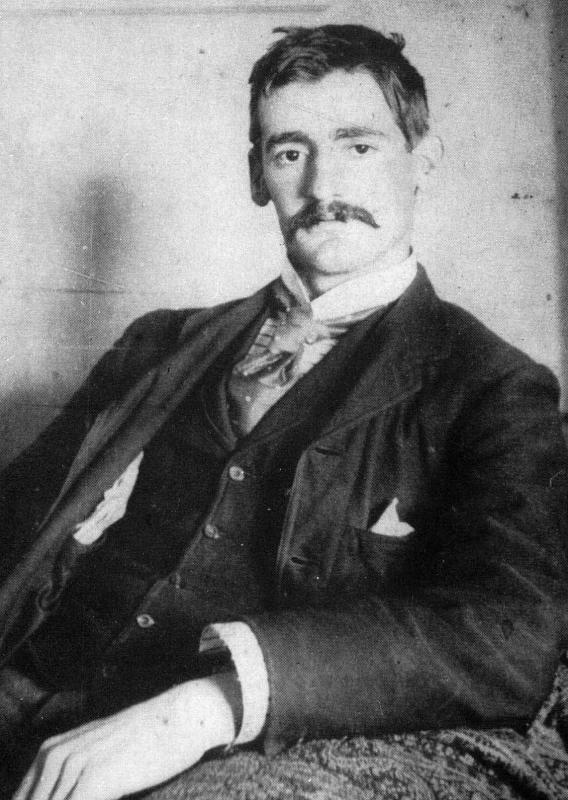 Today is the birthday of the Australian poet Henry Lawson, who was born June 17 1867. Public celebrations to mark this event were held last weekend, to coincide with the Queen’s Birthday long weekend. There are two festivals in his honour in the Western Plains region of New South Wales. The town of Grenfell has one because that’s where Henry Lawson was born, and so does the town of Gulgong because Henry’s parents moved there when he was just six weeks old, and spent his first five or six years there. Willoughby council in Sydney holds a bush poetry reading every two years at Henry Lawson’s Cave, and this year it fell on Henry Lawson’s actual birthday. Henry Lawson’s Cave is a small cavern which the author used as an occasional refuge, and perhaps wrote some of his work there. Another site for Lawson-lovers to visit in Sydney is the statue of Henry Lawson near the Domain, an area that Lawson enjoyed walking in, and perhaps sometimes slept out in. Henry Lawson is said to one of our three national poets, the other two being Banjo Paterson and C.J. Dennis, yet it is as a writer of short fiction that he really shone. His style is quite modern, being spare and unflinching, with plot being less important than powerful imagery. He has sometimes been compared to Hemingway and Chekhov in terms of a lean, raw writing style. His mother was the feminist Louisa Lawson, and the political bent of his work was greatly influenced by her and her radical friends. His importance as an Australian bush writer is that he wrote of the realities of the Australian bush, rather than the romanticised version you get from Banjo Paterson. Henry Lawson was born to a struggling family on the goldfields, and his parents’ marriage broke up; as a man who greatly admired his mother, he had a deep appreciation of how hard bush life could be for women, and how strong they needed to be just to survive, let alone thrive. The outback frequently appalled Lawson, and he saw it as a place of suffering. Yet his perceptions of the bush have helped to shape our identity, and he had a gift for capturing and evoking the national character in just a few words. He stressed the egalitarianism and mateship of the Australian psyche, and championed the underdog and the urban poor. He understood the laconic Australian sense of humour, with its sharp sense of irony. Lawson’s life was a sad one; he was bullied as a child and never felt that he fit in, his little sister died, his parents split up, he went deaf early in life which increased his sense of isolation, he struggled to gain recognition and find steady work, his marriage was unhappy and mirrored his parents’ by ending in separation, and he drank to ease his sadness which made things worse. He spent time in gaols, convalescent homes, and mental asylums. It’s tempting to think that he inherited a strain of Nordic gloom from his Scandinavian father, and that depression was at the back of many of his misfortunes. Because of this, last year two men did the Henry Lawson Walk, which re-enacted a walk Lawson took with a friend from Bourke in outback New South Wales to Hungerford in outback Queensland – a trip of around 450 km (280 miles). They did it to raise awareness and funds for Beyond Blue, the national depression initiative. Beyond Blue has programs which focus on men’s health, alcoholism, and those facing isolation in rural areas – in fact many of the problems suffered by Lawson in the late 19th and early 20th centuries are still being battled today. He is truly one of the moderns, both in life and art. Lawson is an English surname meaning “son of Law”, with Law a popular medieval nickname for the name Lawrence. The name was especially associated with Yorkshire, as the Lawson family was prominent during the War of the Roses. Lawson has been used as a personal name since the 17th century, with use concentrated in the north of England – an apparent legacy of its Yorkshire origins. It should be noted that Henry Lawson’s father Anglicised his surname from the Norwegian form of the name, Larsen. There is a suburb of Canberra named after Henry Lawson – not to be confused with the town of Lawson in the Blue Mountains. Although Henry Lawson did live in the Blue Mountains at one point, the town is named after the explorer, William Lawson. In the US, Lawson was especially associated with the southern states: John Lawson explored North Carolina in the 18th century, and Gaines Lawson was a Confederate captain in the American Civil War. Alfred Lawson was a popular philosopher in the Midwest, promoting vegetarianism, the end of banking, and racially integrated baseball; an aviation pioneer, he is cited as the inventor of the airliner, although it immediately crashed. The name Lawson charted in the US Top 1000 from the late 19th century until World War II, then had a long break from 1950 to 2000. Since then, the name has been steadily going up the charts and is now #485 – the highest the name has been since the early 20th century. In the UK, the name Lawson has been in the Top 1000 since 2003, and has been climbing since 2010, when the British band Lawson formed. Since their first album came out in 2012, the name has gone up even more steeply, and is now #409. In Australia, Lawson is in steady use, and perhaps also around the 400s here. It’s a name which pays tribute to the first Australian writer to be given a state funeral, and is less popular and more modern-sounding than his first name, Henry, and fits in with popular names such as Lincoln and Logan. Historian Manning Clark wrote that Australia was “Lawson writ large”, and this patriotic name honours the man who who been called “the people’s poet”, “our poet-prophet”, and “the real voice of Australia”. It’s a voice that is not always comfortable to hear, but this is a great name for anyone who loves the real Australia, and not an idyllic vision of it. Lawson received an approval rating of 89%, making it one of the highest rated names of 2012. 39% of people loved the name Lawson, and nobody hated it.